Many IT directors fall into the trap of letting technology dictate their decisions. The traps form when purchasing technology. Lack of budget, research, and organizational vision tighten your hangman’s noose. Inadequate budget means you haven’t prepared or communicated how this will personally affect your customers. Avoid these pitfalls by working backward from the customer experience. Be the hero and talk to your customers. Your technical staff members are a great resource. However their perception is purely technical and they typically don’t see the entire workflow. An analogy would be when eating out, would you listen to your server who says everything tastes great or a friend who eaten there before. Step out of the ivory tower and mingle with your customers at all levels. You’ll be alerted to many potential problems before they happen and be seen as a resource rather than a barrier. When leading people, is it better to be feared than loved? In the book “The Prince” written by Niccolò Machiavelli in 1532, he mentioned it’s good to be both. However if you can’t have both, then be feared. Unfortunately, quite a few managers still subscribe to thinking nearly 500 years old. When top performers are promoted to management, they are often untrained on how to manage people. They either perform badly and have their responsibilities taken away, or they become angry placing their frustrations on their staff. In doing the later, they become feared and create a hostile work environment. This propensity resonates throughout the organization as mangers are promoted to upper management. Hence we often hear the “do it or your fired” mentality. If you think this doesn’t happen to leaders, you’re wrong. Read a few leadership autobiographies that lead you to believe the person can walk on water. Next reread the book and create a timeline of the actions they took. Did they fire or lay off multiple divisions that were not performing? If they fixed the problem through a process or other fundamental change they are, in my humble opinion, a great leader. So how does one become loved, fix the organizational problems, and influence people? Easy, boost your emotional intelligence. Ok not that simple, but think of it this way, “Judgment is the enemy of understanding”. Hold off on judging people when talking to your immediate staff. Listen and understand their perspectives. Once you withhold judgment and start listening, you begin to understand how to motivate them in new ways. Afterwards, give them positive feedback. Listening skills of leaders and managers are a rarity these days. If you want to test their skills, just ask them a simple question. Did they “passively listen” giving you a long winded answer or “actively listen” succinctly restating their idea of what you meant? Overall remember to listen, withhold judgment, and you’ll find the true problems plaguing your staff and organization. You’ll also find new ways to motivate you staff and gain a positive reputation. Imagine people in other departments hearing about and wanting to work for you, you’ll find it’s a good feeling. 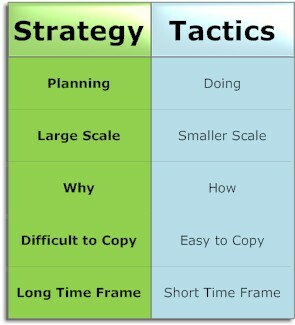 I’ve found irony that managers who tout strategy and tactics don’t know the difference between the two. Strategy is the overall goal of the business. Tactics are the set of tools or actions taken to fulfill strategy. Many managers will say our strategy is to make money and soldiers would say our goal is to win the war. That’s an over simplified viewpoint, which has no thought processes and is worthless. Give it some thought on why your organization is in existence. Who do you serve? Why do you serve? What’s your goal? When conducting meetings a few managers feel rushed and metaphorically stomp their foot down and tell them “it’s my way or the highway” and “you better get this done or else!” While this may be efficient use of time for the manager, he or she loses important resources. Some people find this hard to believe, but as a supervisor you don’t know everything! I took over a new department that had a high staff turnover. Security, accounts and paperwork were a mess, which required me to spend ten to eleven hours a day just to keep the department running. Did I keep the same processes they had used for the past twelve years? No, I solicited feedback from peers, reflected, and made sweeping changes. Thereafter, I had two to three hours each day to spend on developing the department and left after eight hours. A closed circuit television station was in bankruptcy mode since its inception. There were five staff members and over 50 volunteers. I started networking with broadcast engineers and managers at other stations while learning this technology. I pulled the staff together and solicited feedback. Giving them the empowerment of high level decisions sparked extraordinary changes. When asked who did it, it was “we did it”. I garnered support from upper management, put them on two national cable providers, and they made their first profits. The gist of the examples are “people support what they help create” and take advantage of the experience and knowledge around you. There’s much more to each example, but this is a short blog post that I don’t want to bore the readers with. There is common ground between IT and business goals, which needs to be articulated into the languages of business, “finance and value.” An understanding of the business goals and the mindset of decisions is crucial; otherwise the chances of failure greatly increase. First getting a grasp of the IT’s capabilities and how credible they are through performance metrics is necessary. The second step is gaining a solid understanding by assessing customer satisfaction and meeting with managers. This gives clues to functionality of the current systems and processes in place. Finally, assessing and developing relationships throughout the organization is necessary for collaboration. Politics is often used in a negative connotation, but politics get things done. After the initial steps have been taken, I’m ready to begin the alignment process. This is done through meetings, research, planning, negotiation, changes, implementation, and reassessment. Reassessments and reflection on the current systems are always necessary. After all, the only constant is change. When doing alignment keep it simple otherwise keep a drawer full of aspirin. The staff and systems should be lean, whereas I prefer the cross-training approach. Emphasize accountability from start to finish, otherwise you’re asking for failure. The two evils that will catch up to all of us are time and budget.